The use of a hypnosis wheel was popular in the early 20th century as a way of entering trance or using self help hypnosis scripts. In terms of hypnosis nowadays, such ideas and props are a retro novelty, and are more commonly used as an optical illusion (having watched a hypnosis wheel for a few seconds, the illusion of something enlarging or shrinking is quite strong). 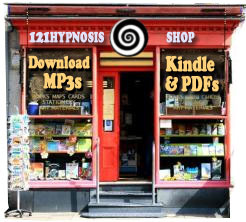 The following instructions are taken directly from the inlay card that is part of the hypnosis wheel set. “Now as I relax back in my chair, my gaze is getting more and more concentrated on the hypnosis wheel and my eyes are becoming very very heavy and very very tired. It is so hard to keep my eyelids open. They are so heavy and so tired… but they won’t close yet because I am concentrating powerfully upon the hypnosis wheel. But now, as I count slowly from one to ten, they begin to close. My eyelids are closing, closing down. One… two… how very heavy and tired my eyes are. How they burn. They are so heavy and so tired. Three… my eyelids are closing, shutting out the light. Four… my eyelids feel just like lead. I am closing them tightly and shutting out the light, letting them rest. Five… six… eyes are closed right down together now. Seven… eyes all closed shutting out the light. Eight. It feels so good to just close my tired, tired eyes and let everything be just quiet and dark. Nine. Ten. My eyes are closed tight together now, everything is all quiet and dark. “Now that my eyes are closed, I am beginning to drift off into a drowsy state. My arm holding the hypnosis wheel is dropping relaxed into my lap… my head is dropping forward onto my chest… and I am sinking down into a drowsy state where everything is all calm and relaxed. I can just feel myself sinking, sinking and floating down into a drowsy state where all is calm and quiet. My body is perfectly relaxed, my mind is free of all concerns and worries, my nerves are calm and free of all nervous tension. My entire body, mind, and nervous system is in perfect harmony, and nothing can ever more disturb the harmony of my thoughts”. Having repeated the above “Sleep Formula” to yourself, stop speaking now and let yourself drift and relax in the chair in perfect comfort and rest. You may find yourself dowzing gently off to sleep… then shortly you will again arouse yourself feeling so much benefitted for these restful and helpful suggestions. This little session in applied auto-suggestion, using the hypnosis wheel, has done you so much good. Use this technique with the hypnosis wheel nightly for a little while; it will work wonders for relaxing your body and removing all nervous tension”. I would like to try it, to see how it works. Would like to purchase a wheel for my own use. I had a wheel many years ago and would like to have one once again. i am a psychologist,I had a wheel many years ago and would like to have one once again. I have also been looking for a hypnosis wheel. Have searched on e-bay, amazon, and many other sites on the net that have information about the wheel or examples of it. So far, nothing. I find these spirals to be excellent. They are cheap, and spin beautifully with a lowered point in the middle. For those who are interested, I will be posting a special dual sided spinning wheel on ebay within the next 2 weeks. Blacklight effective (I.e. charger). Very unique item and hard to find. Best of luck. Rachel, Do you know if You’ll have another one in the near future? I’d love to get a Hypnosis Spiral as well. I know right. i cant believe this.